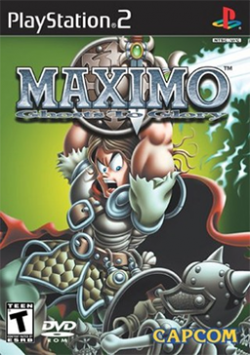 Game description: After fighting in a war, the young knight Maximo returns home to find his kingdom in shambles. Not only is the countryside filled with the undead, but the four wise Sorceresses have been imprisoned throughout the Kingdom; and to make matters worse, his girlfriend, Princess Sophia, has been forced to marry the scoundrel Achille. Now it's up to you to help Maximo rescue the Sorceresses, stop the marriage, and restore good to the kingdom. These tasks won't be easy, but you'll have Maximo's sword and shield and the power of the gods on your side. Game works fine and stable at about 200% speed. Description: The sound effects come out of the wrong channels - sounds from the left come out of the right speaker and vice-versa. Workaround: This has been resolved in recent PCSX2 versions. For older versions there's no known solution. Enable mono sound from the in-game menu. Though certain sound effects (e.g. checkpoint saves) will still be played in reverse stereo. This page was last edited on 25 February 2018, at 18:06.